Hello Beauties! First of all I just want to apologise for the lack of blog posts on here recently. Last weekend I made the big move to London so I've been busy building all of my furniture (my room is a bit like an IKEA showroom), so do let me know if you'd like to see a room tour or a dressing table/makeup storage type post! On top of that I also started my new job on Monday so I've been busy settling in and learning the ropes, which has left me pretty shattered. Anyway, today I thought I would share with you all some of the hair care products that I've been using and loving lately, as it's been a while since I shared any hair related items. Anyone who knows me knows that I'm a bit of a product junkie when it comes to my hair. I have thick, curly/frizzy hair which I straighten regularly so I need products to ensure that my hair remains healthy and continues to grow healthily and preferably quickly...which is where some of the new Redken releases come in. 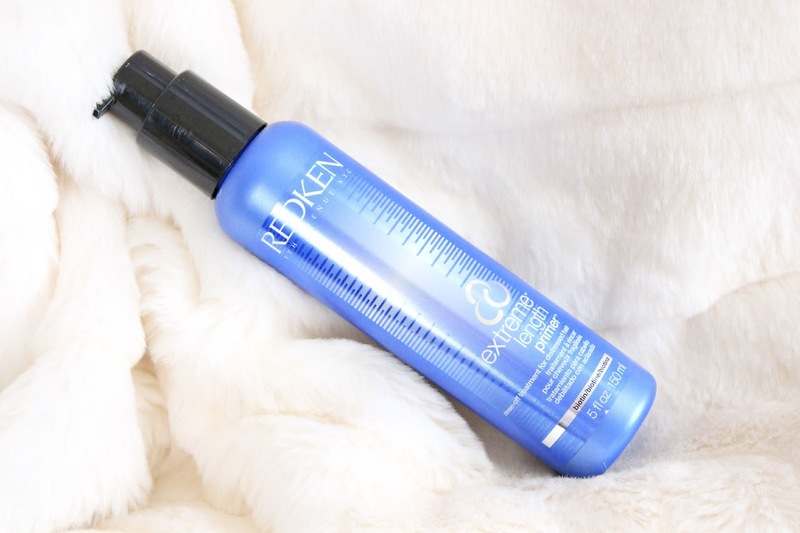 I've always been a fan of the various Redken 'extreme' products for keeping my hair healthy, with the mask and anti-snap serum being regulars in my haircare draw, so it was no surprise to me that I loved these new products equally as much. 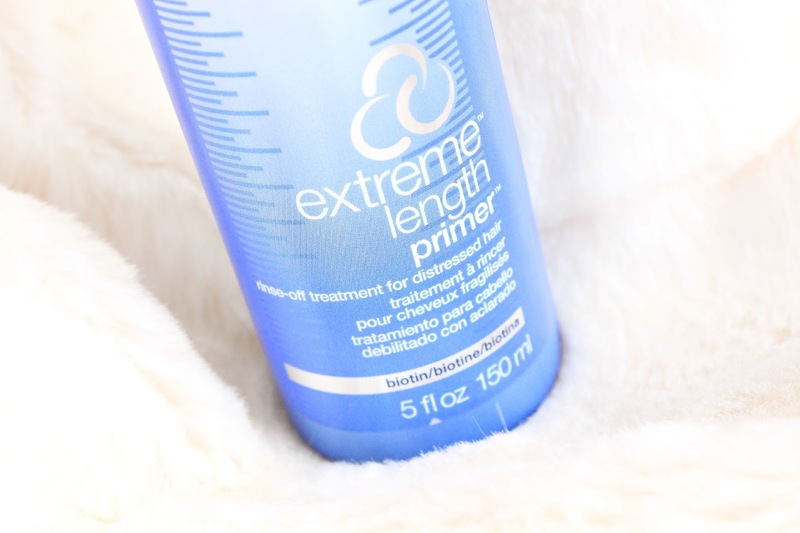 The first product I've been trying is the Extreme Length Hair Primer, which is more of a hair conditioner than a primer I'd say, as you use it once you've washed your hair. This has the same sweet almond like scent as the other products in the Extreme range of products, so if you're a fan of any of the others then you'll definitely love this one. But aside from the gorgeous scent, this product is actually amazing for keeping your hair moisturised and conditioned. 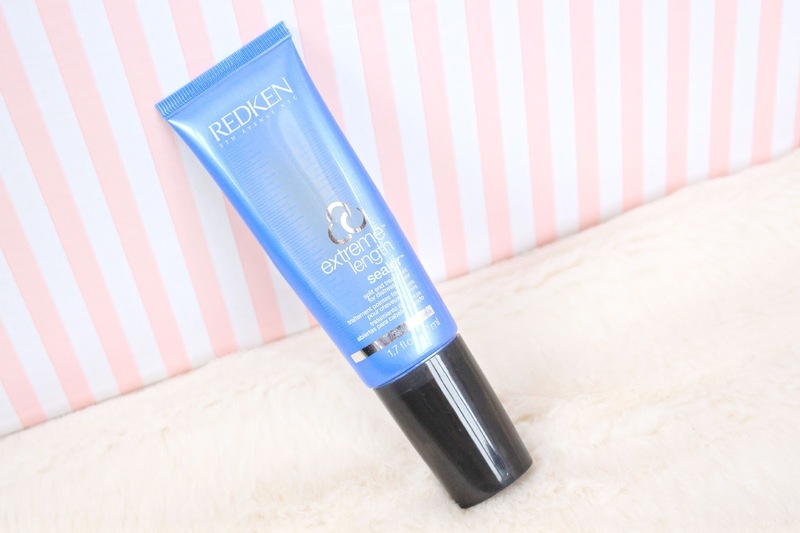 Straightening my hair usually leaves the ends dry and horrible, meaning that when I grow my hair it grows uneven and looks quite dead, however since using the Redken Extreme Lengths Primer my hair has felt smooth, moisturised and healthy. The ends no longer look dead and I've noticed that my hair has been snapping a lot less...in fact, this product has the same effect as a hair mask which I leave on for around half an hour with only a mere 2 mins of use, which I think is amazing. If you struggle with dry, scarecrow-esque hair like myself, then I'd really recommend giving this a go as it has literally transformed my hair. Redken have also released an Extreme Lengths Sealer, which claims to seal your split ends and stop healthy hair from splitting. 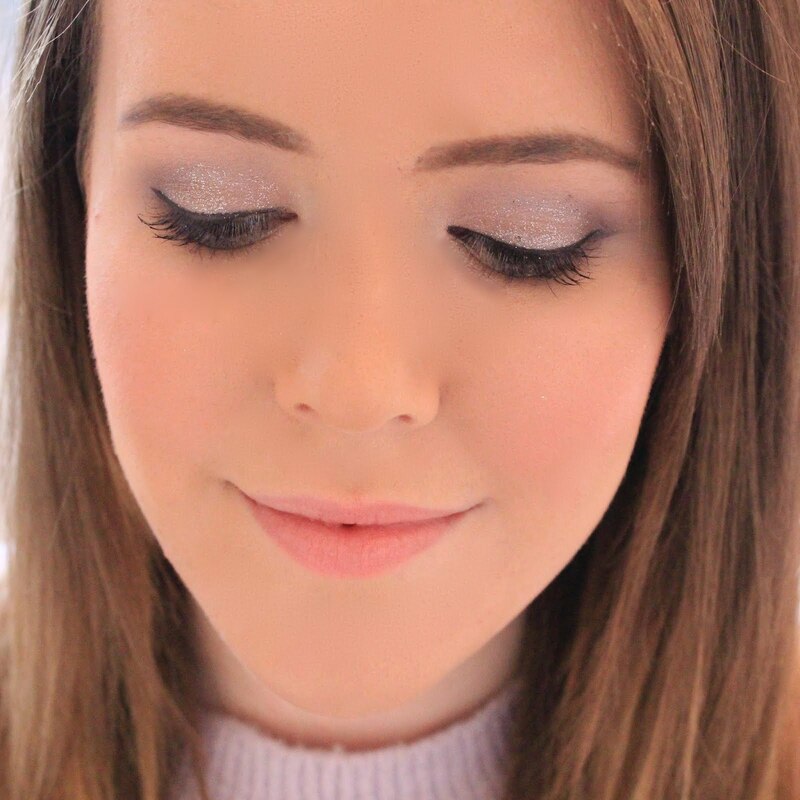 Now, I do realise that the only way to really 'cure' or 'fix' a split end is to get it cut out, however being the hairdresser-phobe that I am, I'm always on the look out for new products to help with the appearance of my split ends, and keep my hair in tip-top condition. 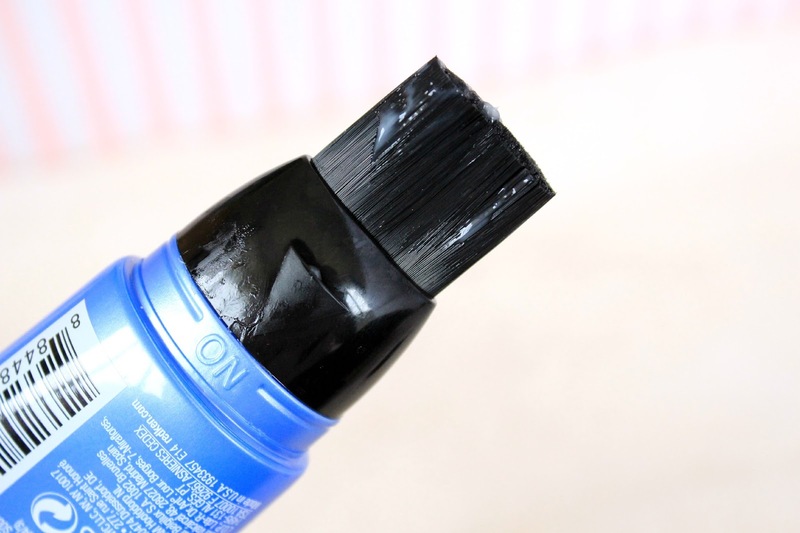 The product comes with a brush applicator which is unusual for a hair care product and honestly, a little bit pointless. I found the brush applicator really difficult to work with and make sure that I was getting all of the areas that needed the product. In the end I just squeezed some of the product onto my hand through the brush and then combed through my hair using my fingers, which I found much quicker and definitely more fuss-free. However, minor complaint aside, I also really like this product. I was slightly worried at first that it would make the ends of my hair separate and have that greasy look that some products can create, but it left my hair looking clean and feeling soft which was exactly what I was looking for. After using this I found that the ends of my hair felt softer and a lot less coarse and definitely looked healthier...I love the product, I just wish they would get rid of the brush! Overall, I'm seriously impressed with these products and I would expect nothing less from Redken. If your hair is damaged, or you'd like to to be a lot softer then I really recommend checking out the Extreme/Extreme Lengths range from Redken as all of the products I've tried have been fantastic. I've also noticed that my hair has actually started to grow a little quicker too. My hair doesn't normally grow too quickly, hence why I'm always growing it out, and over even just the past couple of days I've noticed that my hair has grown a little and seems longer. I'm not sure if that's just a happy coincidence or that these products are actually miracle workers, but I'm happy either way! The Primer and Split End Sealer, along with the rest of the range are available from Shop Rush here. Shop Rush have also been kind enough to provide me and my readers with a discount code which entitles you to 20% off any Redken products when you spend £30 with the code BECKYMUSTHAVES, or if 25% off when all 6 Redken Extreme products are purchased with the code BECKYMUSTHAVES25. The offer is valid until the 31st August and all of the terms and conditions are listed below. Offer ends midnight 31st August and is only valid when fans spend £30 on Redken at shoprush.com. Your voucher code is valid for 3 uses per person and must add code: BECKYSMUSTHAVES at basket before checkout. Promotional prices are based on original RRPs. To save 25% on the Redken, fans must add all six items from the Redken Extreme range at basket and add code:BECKYSMUSTHAVES25 instead. Free next day delivery orders must be placed before 3pm and will be delivered the next working day, this offer applies to orders of £60 or more. Read our Delivery Policy and Terms & Conditions before completing checkout. I have always heard great things about Redken, I really do need to try something from them!